Ever wondered what it would be like to utter those words? I can tell you–it’s great! Many of you know that I had a corporate job in addition to the blog and my essential oil business. I’m excited to share that I’ve left the corporate world and am blogging and oiling for a living. Don’t worry! You’ll still get all the great time-saving, money-saving, urban homesteading, make-it-don’t-buy-it articles that you’re used to. Plus I’ll share what I’m learning as an entrepreneur and work-at-home mom. Think you might want to break those corporate chains someday? You can do it! If you could leave your job tomorrow, what would you do? Share in the comments! Omg Pam. That is fabulous! I am so happy for you!!!! 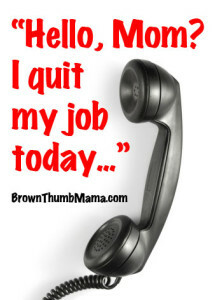 Oh my goodness I had the same nerves when I told my mom I was leaving my job!! It’s totally terrifying (in a great way) to work for yourself, I’ve already decided that I am completely ruined for the corporate world. Which is good incentive to work even harder at what I love doing. Wanted to say a BIG Congrats! I have been quietly following your posts for awhile now and you have much to offer. I stepped out into the world following my own Path many years ago and have never held back or regretted it. Thank you! This is such an exciting time for our family! Wow! This is EXACTLY what I plan on doing since I am in the oily business too! I can’t wait until it actually happens!!! I have decided I am unable to be an “employee” to anyone. How long did it take you to build your biz?? 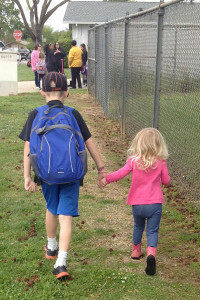 So very encouraging for a corporate mom, with a heart for canning, crafting, gardening, living and being with my babies!